Distribution map of earth fruit (Geocarpon minimum). 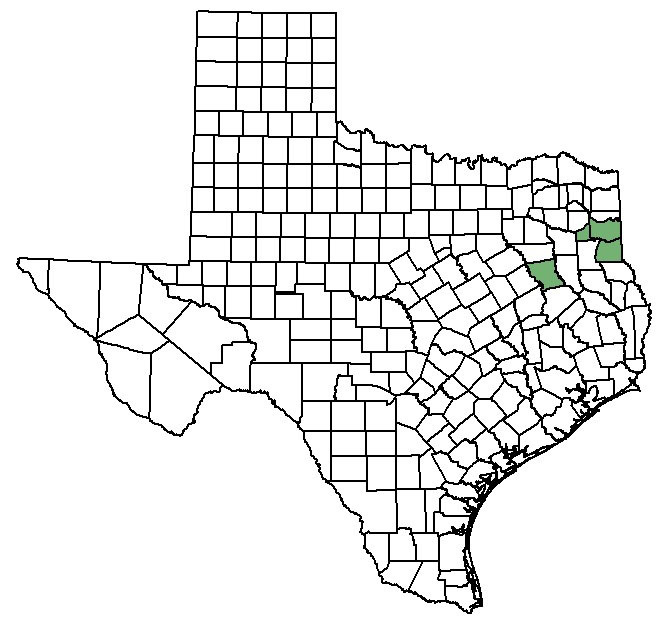 Earth fruit is known from Anderson, Gregg, Harrison and Panola counties in Texas, and in the neighboring states of Arkansas, Louisiana, and Missouri. Earth fruit is a tiny, succulent-looking, erect annual (1-4 cm tall), which varies in color from green to pink to reddish-purple. Leaves occur opposite to one another along the stem and are oval-shaped with smooth edges. The flower base attaches directly to the main stem rather than attaching by a stalk. Also, the flower base connects to the main stem at the same point as a leaf. The flowers have no petals but five, minute, reddish to red-green, succulent, leaf-like structures and five male, pollen-bearing structures. Fruits develop into a 3-chambered capsule, which dries and then splits open to release its minute seed. Earth fruit is an erect succulent with small reddish-green leaf-like structures, but no petals, and 3-chambered fruits. Earth fruit can be identified by its unique combination of characteristics including its pink-purple, succulent appearance, green petal-like structures (no true petals), and fruits with 3-chambered capsules. 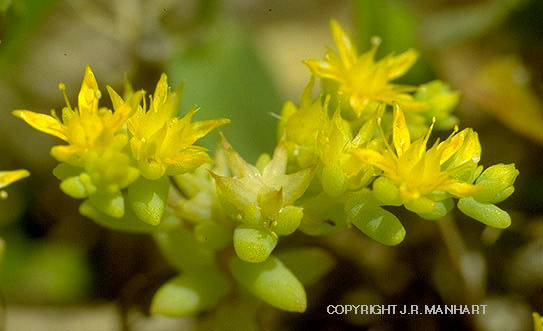 Water pygmyweed (Crassula aquatica) can be distinguished by its horizontal stature. Water-starwort (Callitriche peploides) and yellow stonecrop (Sedum nuttallianum) can resemble non-flowering earth fruit. 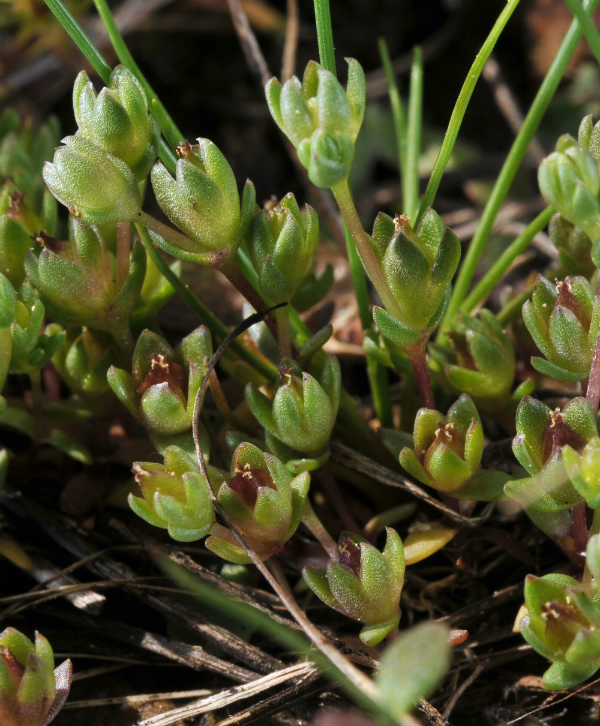 However, water-starwort stems grow horizontal to the ground and yellow stonecrop has rounded (opposed to pointed) leaf tips. 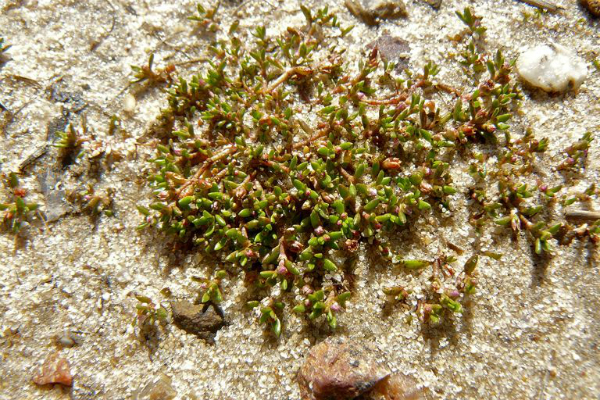 Water-starwort stems grow horizontal to the ground. Yellow stonecrop has rounded (opposed to pointed) leaf tips. 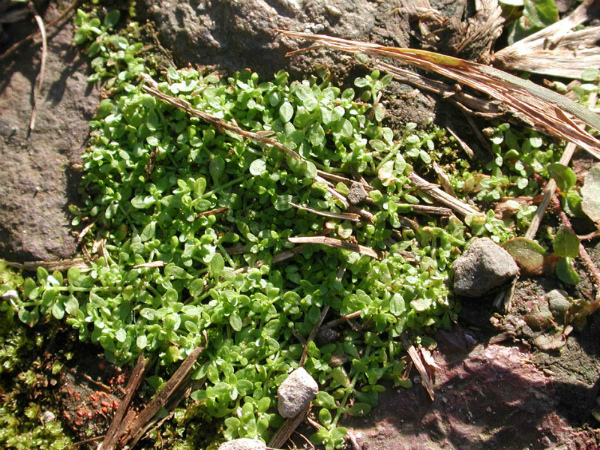 Water pygmyweed lies horizontal to the ground. 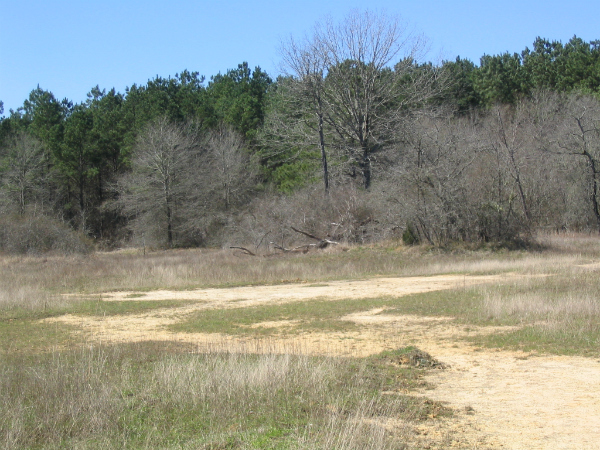 In Texas, earth fruit occurs in poorly draining, saline soils along the edges of shallow depressions in sparsely vegetated areas of the Piney Woods. Credit: Jason Singhurst - Texas Parks & Wildlife Dept. Flowering occurs from February to March. Earth fruit is only detectable in late winter/early spring around the time it flowers (February-March). Earth fruit is very close to meeting the requirements needed to be taken off of the endangered species list. For earth fruit to be removed, 15 stable populations must be protected, 15 years of monitoring data must be taken, and earth fruit’s genetic variation must be represented in the protected populations. Only the last criterion has yet to be met. Genetic variation is the variation of genes within or between different populations of a species. The less variation there is, the less chance a population has to adapt to changes in its environment, and the greater the chance of the species going extinct. Research has been initiated and once complete, protected sites could encompass the extent of genetic variation within earth fruit populations.